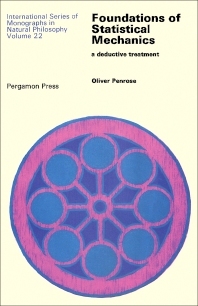 International Series of Monographs in Natural Philosophy, Volume 22: Foundations of Statistical Mechanics: A Deductive Treatment presents the main approaches to the basic problems of statistical mechanics. This book examines the theory that provides explicit recognition to the limitations on one's powers of observation. Organized into six chapters, this volume begins with an overview of the main physical assumptions and their idealization in the form of postulates. This text then examines the consequences of these postulates that culminate in a derivation of the fundamental formula for calculating probabilities in terms of dynamic quantities. Other chapters provide a careful analysis of the significant notion of entropy, which shows the links between thermodynamics and statistical mechanics and also between communication theory and statistical mechanics. The final chapter deals with the thermodynamic concept of entropy. This book is intended to be suitable for students of theoretical physics. Probability theorists, statisticians, and philosophers will also find this book useful.